This item will earn you 240 reward point(s). 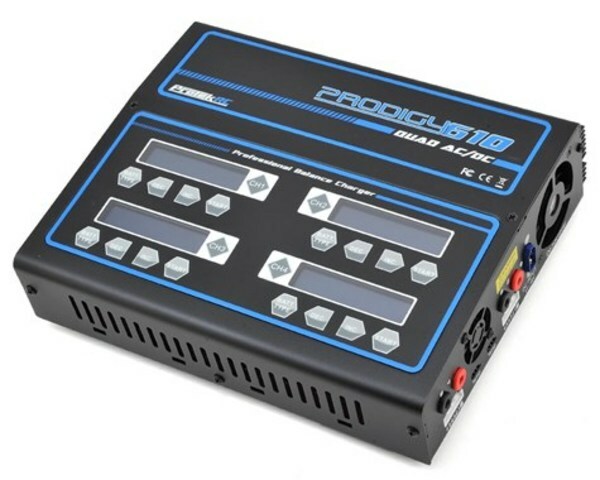 A quad port AC/DC charger that can handle SIX packs, is capable of 10 amp charge rates, worldwide 110V/220V voltage flexibility, with 100 Watts of power per side...the next generation of Prodigy has actually shown up. Backed by ProTek R/C's revolutionary customer support, the Prodigy 610 QUAD AC delivers the power you need to get your batteries charged quick and removes the requirement for an external power supply! The Prodigy 610 QUAD AC delivers a range of effective, yet useful functions. The Digital Power setting permits users to power extra DC powered devices, while the Pre-Charge function offers users a chance to conserve Lithium batteries that have been released too far. Additionally, compatibility with all common battery types indicates the Prodigy 610 QUAD AC is an all in one service for your battery management needs. These includes just scratch the surface of what the Prodigy 610 QUAD AC delivers. Pick one up and see for yourself why Protek R/C is discovered on the benches of a few of the most highly regarded R/C professionals worldwide, including racer Atsushi Hara, pilot Tim Jones and more. This charger includes a Hi-Voltage LiHV mode that permits you to securely charge Hi-Voltage LiHV capable batteries. You can change the charging end voltage of this mode up to 4.40V per cell, which is considerably higher than 4.20V per cell of an ordinary LiPo battery. Charging at this higher end voltage needs a Hi-Voltage LiHV capable battery, however the power gains are considerable to the total punch and power for the R/C model. However please note: battery voltages surpassing 4.20V per cell is prohibited from approved racing rules, such as ROAR, IFMAR, etc.